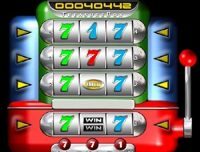 There are several slot machines of this kind at online casinos. 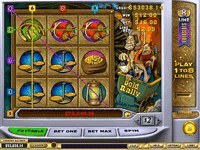 Despite of the large number of reels (9), the slots offer "only" 8 pay-lines. However, there are other bonus features and large number of winning opportunities in these games. 9 reels format allow big top wins and most of these slots have progressive jackpots. Gold Rally have already awarded 3 online casino players with almost $2 million jackpot wins each. Gold Rally 8-Line is a new 9 reel slot machine game with 8 pay-lines that generates ones of the biggest progressive jackpots on Net. The largest Gold Rally progressive jackpot of $2,189,748 was hit recently; there are already 3 winners of about $2 million Gold Rally jackpots. Coin size is fixed at $2 and players can bet up to $16 per spin. The progressive jackpot resets at $75,000 (minimum value) while the average win is about 10 times larger. Just hit 9 Scattered Scales to win progressive jackpot, providing you bet max (8 lines). Dynamite is a Wild symbol that substitutes all other symbols excluding the scatter Scales. If you have Dynamite symbol appears in all 4 corners on the screen, you will win a bonus round game. This is a great slot for those who want to mine a gold or win really big - million dollar jackpots. Other 9 reel slots that you can find at Playtech online casinos include: Chineses Kitchen and Vacation Station. You can play free Flash-based 9-reel Vacation Station video slot (Playtech) presented by online Casino Tropez. Treasure Box is a unique progressive slot machine with 9 reels and 4 pay-lines from Slotland casino. Choose coins from $0.50 to $2 and bet up to $8 per each spin. Treasure Box is one of the most revolutionary slots around today. It's similar to multi hand video poker games. On the 1st spin only one line spins, you can then hold all or some of the symbols which then move to the remaining lines. If you bet on all 4 pay lines you then either end up with 4 winning combinations or 4 chances of hitting a winning combo on the next spin. We recommend betting on all 4 lines. The slot has a Wild symbol - Treasure. If that symbol appears on any activated pay line the amount of the bet is added to your personal jackpot. Hit the jackpot combination on all 4 reels and you get the treasury jackpot that sometimes grows over $100,000. Treasure Box is really entertaining slot machine with high 98% payout rate and Treasure bonus feature. To win the Treasury you need to hit the combination of the 3 symbols on the bottom reel, which you should then hold so it will appear on all 4 paylines, then do a re-spin to win the Treasury. If you don't win the Treasury, it will still be there next time you play in the bonus game. Over time you'll build up a nice fund and it will always be there for you to win. The Golden 8 is another Slotland's 9 Reel online slot machine with 8 different pay lines and shared progressive jackpot that can reach up to $200,000 or even more. Bet $0.5 to $1.5 per each of the pay-lines or up to $12 per spin. Now you can play a mobile version of Golden8 on your java-enabled cell phone to win the same jackpot. Golden 8 is a progressive jackpot game and we recommend you always press the Bet Max button to bet max number of coins. Don't set the maximum coin size but play all 8 lines to increase your chances of winning. Get 3 "Bar" symbols on any of the pay lines to win the progressive jackpot. Among the other exciting features Golden 8 slot offers a bonus spin round. You get 3 or more diamonds at once on the screen, one diamond symbol is highlighted. When all 6 diamonds are highlighted, you get one free bonus spin. The winning spins may be quite large. The amount won will be based on the amount bet on the initiating spin. Increase your bet when you are close to earning the bonus spin in order to maximize your winning potential. Slotland's 9 reel slots games are compartible with most browsers and PCs (AOL, Mac and WebTV) and offered in mobile versions. The average payout is 98%! You can find Golden 8 and Treasure Box slots only at Slotland casino - get 100% match bonus up to $100 free with your first purchase plus random bonuses from 10% to 100%.